Here...Hand Delivered...Your Natural Way to Become Extraordinary! Use "OnDemand" EWOT™ (Exercise With Oxygen Training) to overcome that plateau, get ahead of the competition. Use "OnDemand" EWOT to Regain Your Energy...Get Up and Go!! German Research has proven there is a specific reason why our energy levels drop as the years go by, a physiological change in energy production as we age. They also proved that EWOT-Exercise With Oxygen Training can reverse that change to help you maintain or regain the energy and stamina of your youth. They go so far as to claim we can slow the aging process itself. Longevity's "OnDemand" EWOT Systems duplicate the equipment and conditions researched by the Germans, to provide you with true "OnDemand" EWOT. What's "OnDemand"? Oxygen right now, instantaneous, when you need it (no waiting for a bag to fill). Exercise With Oxygen and change your life to be bursting with energy and excitement. Beat the aging process and have fun. Be extraordinary and leave your bored friends inside as you roam, explore, and live your Energetic Life! Contact Longevity today and start your new life now! Why Longevity's "OnDemand" EWOT Systems are right for You! EWOT is "Exercise With Oxygen Training"...which is exactly as it sounds. You breathe oxygen while you exercise on a stationary bicycle, treadmill, elliptical, re-bounder, or any one of a dozen other stationary exercise machines. German Researchers proved in the 1970's that this has profound benefits. Longevity Resources Inc. introduced EWOT into North America in 2001 and remain the leader in EWOT equipment. The problem is that most EWOT Systems on the market today include a "Reservoir Bag" that needs an hour or two to fill with oxygen. That's simply too long! What if you want to exercise right now, start and finish in 15 minutes before work with no waiting? Only Longevity's "OnDemand" EWOT™ Systems provide you with INSTANT OXYGEN, Right Now, no bag to fill, no waiting, ready when you are! What does Longevity's "On Demand" EWOT™ System Include? 1. Two of Longevity's Specialized "On Demand" EWOT™ Masks. Longevity duplicated the type and style of mask that was used by the German Scientist Manfred von Ardenne when he PROVED that EWOT works. No other company in North America has Longevity's "On Demand" EWOT™ Mask, Longevity Resources is therefore the only company with a true "On Demand" EWOT System that works! 2. Extremely High Quality and Reliable OxyMax Oxygen Concentrator. 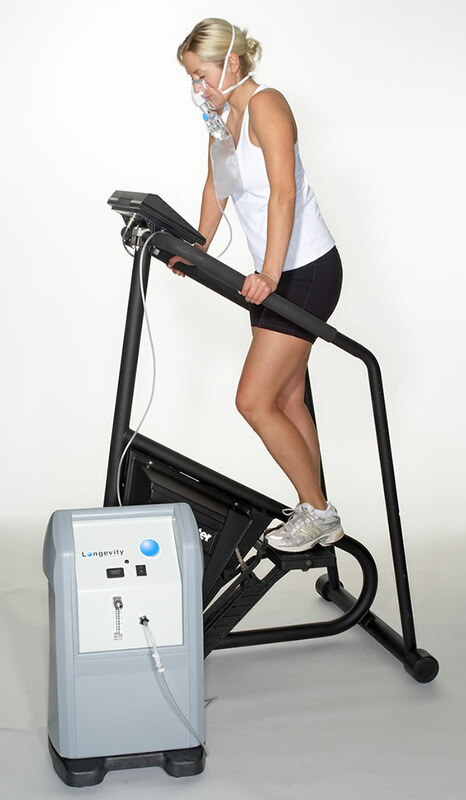 The OxyMax produces the purified oxygen for you. In use by thousands of people using EWOT since 2001, the OxyMax has earned reputation of being high quality, and highly reliable. 3. A "Bubble Humidifier" to 'humidify' the oxygen before you breathe it, plus all of the tubing and detailed instructions. Longevity has the "On Demand" EWOT System that will change your life. Are you ready? Check out Longevity's "OnDemand" EWOT™ Packages below, all in stock and ready to ship to you today! with "OnDemand" EWOT™ from Longevity Resources Inc. The Silver Package Provides the minimum oxygen required as researched by the German Researchers, which is 8 Liters Per minute. It also includes ALL of the accessories that you will require to get started right out of the box. At 40% more O2 than the Germans used in their study, this workhorse OxyMax 12 LPM will set you up for phenomenal results at a great price! Of course it comes with everything that you need. Now this is getting crazy... at 300% of the oxygen the Germans found 'effective'...24 LPM "OnDemand" EWOT System will make you feel like you belong with the "Olympians". All the accessories are included, AND since it is nice to get a little help from a friend now and then we also throw in Free Lifetime Customer Support...we're always here when you need us. Now we know how Hercules did it...this package provides 400% of the Oxygen studied by the German Researchers. The Hercules "OnDemand" EWOT Package is the highest flow rate EWOT Package of all time, anywhere! Talk to a Longevity Product Specialist. Your New Life of Energy Starts Today!